Createspace Independent Publishing Platform, 9781494986704, 344pp. She slumped against the rock and hugged her arm close to her body. "Do I have a clan? I bear the marks of my clan, my history from the day I left childhood behind to the moment I was accepted as a fully initiated member, right here, written for all to see, yet I ran away from my clan before they could finish killing me." But not everyone welcomes the news. Some, including Nulo's wife, want to ignore the strangers, but Nulo knows they must meet the people who left the message carved on the stone. He doesn't know that others also roam the wild country, men pushed out of their villages and left to survive any way they can. The third entry in the Misfits and Heroes series, A Meeting of Clans follows a group from the north coast and one from the south coast as they push across the wild interior of what is now southern Mexico, 14,000 years ago. Kathleen Flanagan Rollins worked as a composition and literature professor at Mott College in Flint, Michigan. While there, she developed an interest in early explorers in the Americas. This interest only grew when she traveled to ancient sites in Guatemala and Mexico. Inspired by her adventures, Rollins began her popular Misfits and Heroes series. This includes Misfits and Heroes: West from Africa, which was listed as one of Kirkus Reviews' Best of 2011, and Past the Last Island. Both books received five-star reviews from Foreword Clarion Reviews. 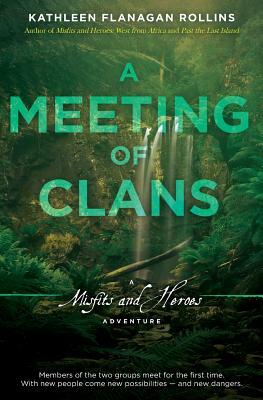 The latest addition to the Misfits and Heroes series, A Meeting of Clans, is now available.